Since 1989, Reinhard Flatischler has been researching the effects of TaKeTiNa on the human psyche and physiology. The research started in collaboration with Dr. H. Peter Koepchen under the umbrella of the International Society for Music in Medicine. Soon the research activities grew into a remarkable research project with wellknown physicians and scientists. It induces predictably vagotonal states as well as a deep relaxation of the nervous system. It also has a proofable effect on the resynchronisation of internal rhythms. This effect has also allowed the remarkable successes in the project TaKeTiNa for high pain patients initiated by Dr. Gerhard Müller Schwefe, head of the German Society for Pain Therapy. Currently Dr. Ali Behzad and his group at the University Hospital of Erlangen are investigating the effects of TaKeTiNa music therapy on patients undergoing allogeneic stem cell transplantation on quality of life, depression and immune response among other parameters (clinical trials: NCT02976558). Preliminary results presented at the European Congress of Integrative Medicine (ECIM) 2018 are promising. They show an improved quality of life and less acute rejection of the transplant (graft versus host disease) in the treatment group, consistent with the multi-layered effects of TaKeTiNa on body and mind and strengthening the emerging evidence of an interwoven psycho-neuro-endocrino-immune-system (PNEIS). Medicine continues to advance the management of illness through the understanding of disease-promoting processes at the biochemical and molecular level. However, although these medical processes which help us overcome illnesses are increasingly understood, a scientific understanding of ‘self-healing’ is still unclear. How is health restored after illness? What are the built-in unconscious mechanisms in us that “repair” us? How are health-promoting measures actually effective? We need patience as many mysteries still elude us but ‘time-based’ medical research has given us some effective insights. Humans can be said to not only have a physical body, described by anatomy and formed from around 60 trillion cells, but also a ‘time body’. As far as we know, biological processes are not carried out only by ‘commands’ or independently from interactions with the rest of the organism. It seems that each interaction or ‘flow’ be it the pulsating secretion patterns of hormones, the processes of food digestion in the abdominal cavity, or the processing of mental impressions in the brain, blood pressure, heartbeat or breathing, body temperature, blink or reproductive instincts all follow their own particular rhythms. Only this kind of adaptive-anticipatory interplay makes it possible for auto-regulatory processes to run economically and quickly within us. In essence, Reinhard Flatischler’s innovative rhythmic education TaKeTiNa is also based on breathing and movement. In TaKeTiNa the participants succeed in separating breathing and movement from consciousness and return to innate inner rhythm states, which positively influences the entire organism. The effect on individuals is amplified by the synchronisation of the group. Our measurements of heart rate variability during pauses between TaKeTiNa rhythm interventions show a strong increase in vagotonic activity of the autonomic nervous system as well as increased heart-brain coherence. It should be noted that research at the beginning of the 21st century demonstrates at the molecular level that fatal cascades of disease processes can be dealt with in the vagotonic phase. Body-specific repair procedures, it seems, only take place in vagotonic phases. At the same time, mainstream medicine is aware of the fact that a natural extension of vagotonia can only be achieved to a limited extent by medication. The access to the autonomous nervous system, that is, the path to the synchronisation of the vegetative system, is, however, possible with non-pharmacological methods, such as TaKeTiNa, the rhythm process, developed by Reinhard Flatischler. This measurement of heart rate variability shows the typical progression of a TaKeTiNa session and its effect on a thirty-year-old woman trained in rhythm pedagogy. During the green-marked sessions, we see the phenomenon of “frequency-shifting” in the range 0.1 Hertz. 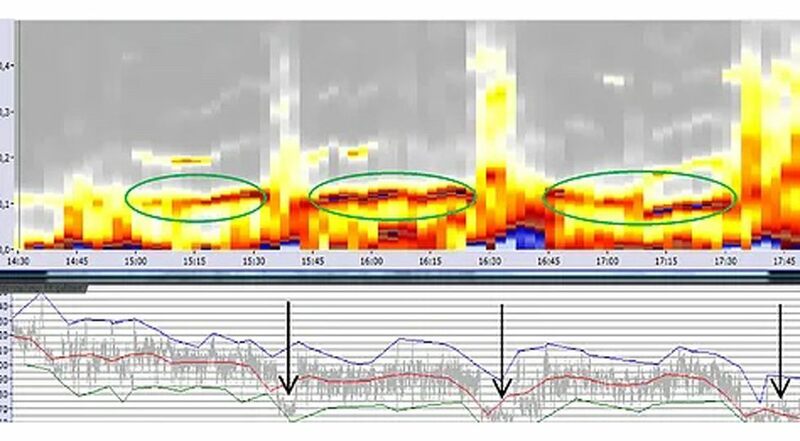 During the blue marked pauses there is a strong increase in the vagotonic activity of the autonomic nervous system, recognisable by a spike in the spectrogram. This marked increase in parasympathetic activity is believed to be a response to the rhythm intervention, which increases with each repetition. 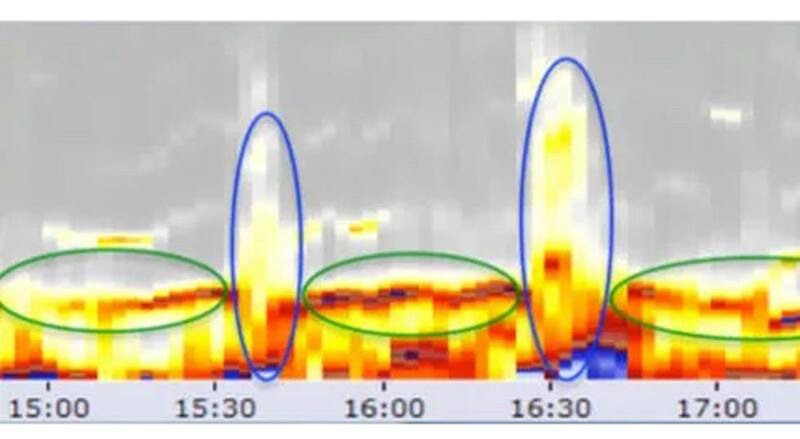 It is also worth mentioning that, prior to the start of the session at 15:00, an identical pattern focussed in the 0.1 Hz range and its subsequent ‘vagus activation´ occurs at a lower level, showing that a “vegetative anticipation” has developed in the experienced person. A healthy heart does not beat uniformly, like a machine or a metronome. 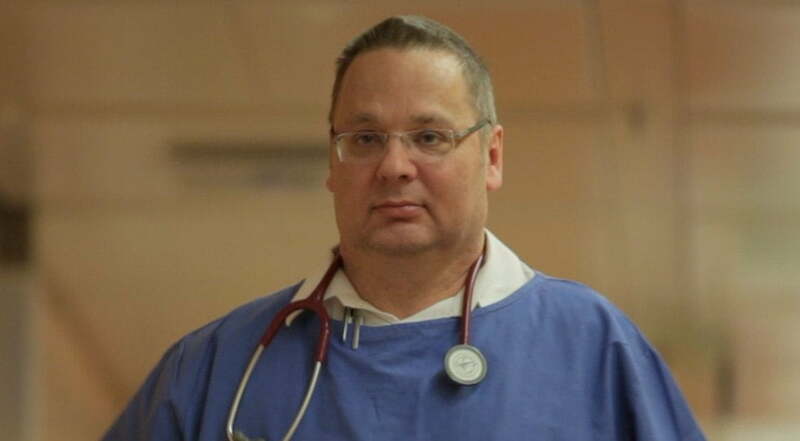 Not even all physicians are completely aware of this fundamental fact. The natural irregularity of a heartbeat is the expression of its harmonious, simultaneous adaptability to immediate situations as well as to simultaneously occurring bodily processes. Ideally, the heart can adapt its frequency to each individual breath. The explanation for this is simple: Every breath creates sub-pressure in the chest. This suction ensures both that air is inhaled, as well as that more blood flows into the chest for a short time. To transport this increased blood volume into the body, the heart beats minimally faster during an inhalation, subsequently returning to its slower pace during exhalation. During a relaxing deep sleep phase there is a ratio of approximately four faster and four slower heartbeats for each breathing cycle. Over a time period of four breaths, the blood pressure varies in a slow wavelength phase to finally return to its starting point. During four of these minimal blood pressure waves, the blood circulation in the tissue increases and decreases. The harmonious time-relationships occurring in our autonomous nervous system are comparable to the overtone spectrum. They are processes that occur unconsciously and that we cannot influence. When multiplied, they lead to the cycles in which hormones are released and point to the rhythmic harmony behind the concepts of all biological processes. This synchronicity and harmony unfolds especially during a state of regeneration – also called “vagal tone” by physicians. We went into our experiments with TaKeTiNa hoping that we would gain medical ‘evidence’ about parasympatetic processes. The visible results we got, however, exceeded our expectations by far: The HRV graphic impressively reflects the synchronicity of the body’s own biorhythms with the phases of the TaKeTiNa process (from safety to chaos to a new level of higher rhythmic understanding and capability). A simultaneous video documentation shows that after phases of rhythmic ‘withdrawal’ or ‘chaos’ (i.e., leaving the rhythm for a period of time, consciously or unconsciously), people unconsciously find their way back into the rhythm. This reintegration at a higher level, done without any conscious cognitive effort, is seen in the participant’s HRV graphic together with an immediate rhythmicisation of the parasympathetic nervous system. The measurements clearly show that TaKeTiNa repeatedly and predictably can cause ideal conditions for the nervous system and the body’s rhythms. I am certain that TaKeTiNa will very soon find its way into medical practice to a much greater degree. Quantitative event-related analysis of bioelectric correlates of cerebral activity has long been part of human medical research extending traditional therapeutic indications (e.g. in epileptology). Thanks to modern high-performance computing systems and complex mathematic algorithms, these techniques not only lay the foundations for a new neurological understanding of the relevance of EEG signals, but also open up entirely new perspectives for complex psychological questions and alternative therapeutic approaches. However, despite improvements of these approaches, especially in areas considered problematic by academic medicine such as chronic pain etc., methodological inadequacies have made verification of the results difficult, explaining why they play no significant role in current medical practice, or at best an outside one. 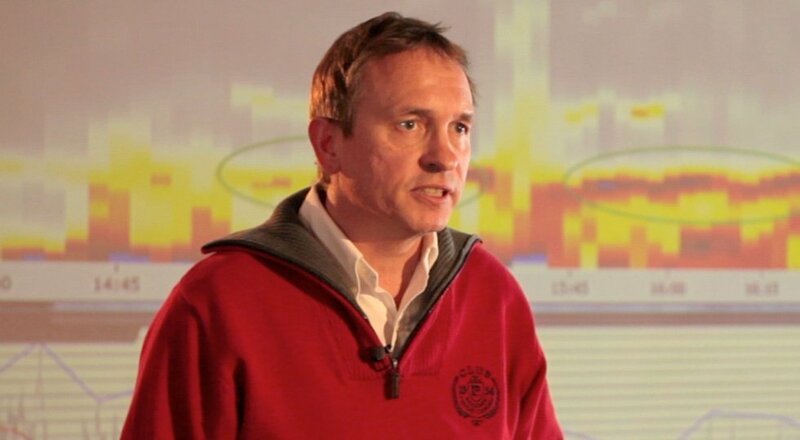 Dr. Michael Überall and his team have analysed EEG results taken from a TaKeTiNa research workshop held over a period of several days in May 2010 at the TaKeTiNa Institute in Vienna. 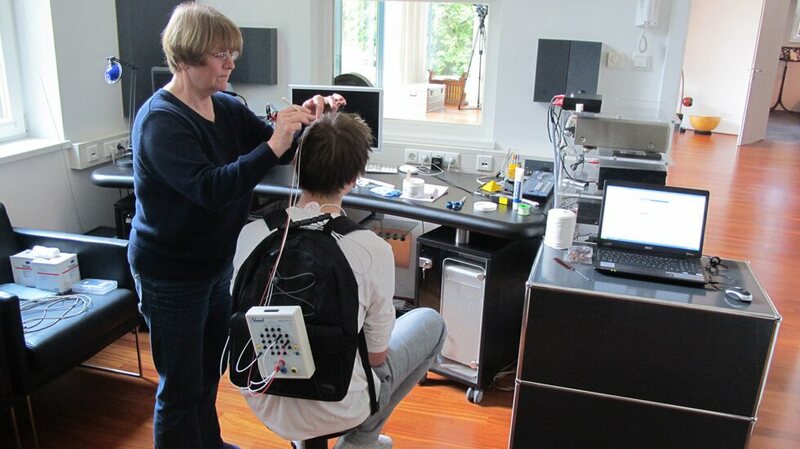 Dr. Überall and his team measured participants’ brain waves before, during and after the TaKeTiNa exercises. The remarkable success of TaKeTiNa especially in connection with refractory chronic pain syndrome led to a call for new research. A pilot-study was carried out in summer 2010 at the TaKeTiNa Institute in Vienna. 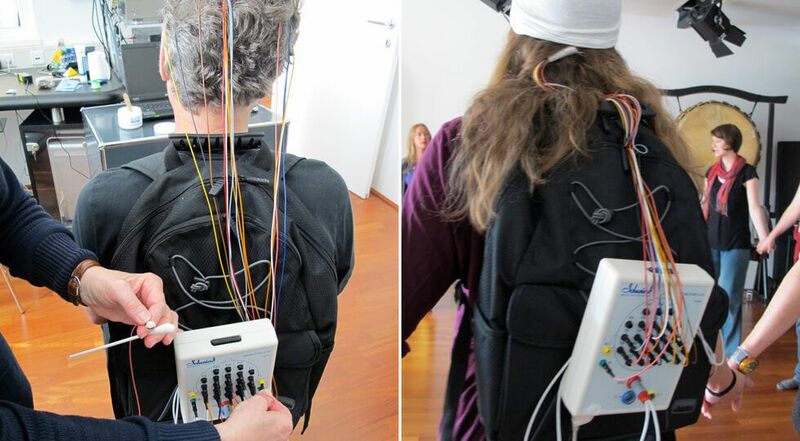 Neurophysiological correlates of cerebral brain activity were recorded using multi-channel electrodes in participants attending a TaKeTiNa workshop and were then analysed. a) certain chaotic phases experienced by participants repeatedly during a polyrhythmic TaKeTiNa journey are of central importance for the development of new endogenous coping strategies to manage chronic illnesses. These should be objectifiable and verifiable via any corresponding neurophysiological correlates (e.g. sudden changes to the frequency bands typical for trance, hypnagogic consciousness, waking dreams, hypnosis, meditation, deep relaxation and increased learning ability). b) the time and duration of these phases should be clearly definable using QEEG analysis. c) QEEG changes associated with these phases should be more pronounced than initial values measured before the exercise phase, i.e. when participants were in a state of complete relaxation. d) these changes should neither spatially nor temporally correspond to other known QEEG changes (e.g. vigilance-dependent or medication-related). The mathematical procedure used was a variation of the multichannel quantitative DAS time series trend analysis which translates the spatio-temporal and energetic characteristics of the morphological dynamics of the real time EEG into a biometrically unique macro-indicator for the brain. This enables a stochastic measurement (in analogy to the theory developed by Selye in the mid-twentieth century for the general adaptation syndrome formulated as integrative EEG-vigilance) and the objective quantification of specific physiological functions within the framework of an integrative concept. We were not only able to clearly identify these chaotic phases, i.e. 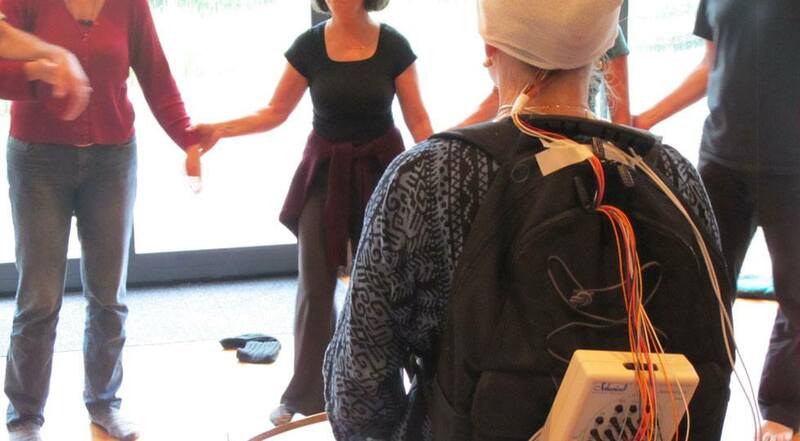 “falling out of the rhythm”, within the EEG traces, but also to identify bioelectrical resting states greater than those achieved by participants immediately before the TaKeTiNa journey (see example below). In addition, the experiences gathered from the rhythm journey initiated an autonomous learning process that not only improved the ability of participants to integrate these unconsciously, but also empowered them to utilise them in well-directed ways – e.g. during the resting period of subsequent follow up EEG measurements – (see differences in the measurement phases of rest before and after the actual exercise phase). This is the first time that modern measurement and computer procedures have found evidence for TaKeTiNa-induced neurophysiological changes in cerebral brain electrical activity. We hope that these studies will become the foundation for an explanatory model for the remarkable effects of this rhythm-based therapeutic concept and also the starting point for completely new TaKeTiNa-supported biofeedback therapies. the final relaxation marker during the final resting phase, after the TaKeTiNa Journey (significant less red/yellow colour compared to the initial situation).